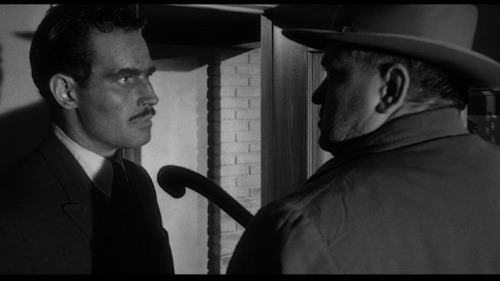 Touch of Evil takes place in a small town on the Mexico/United States border. Mexican cop Mike Vargas (Charlton Heston) is newly married and about to begin his honeymoon with his American wife (Janet Leigh). A hero in his homeland for his battles with drug dealers, Vargas just wants to go on holiday, but the murder of a local businessman brings him into confrontation with Captain Hank Quinlan (Welles). Quinlan’s intuitive methods of investigating crimes often lead him to act in ways that aren’t always lawful. One of these men is heading for a fall. Touch of Evil was Orson Welles last shot at Hollywood. Hired to play the bad guy, leading man Charlton Heston demanded Welles also direct. Studio execs at Universal weren’t keen. Welles had an undeserved reputation for being difficult, his films considered highbrow, even though he always tried to make them with an audience in mind. Touch of Evil is his most entertaining work, a stylish thriller which transcends its pulp origins as a dime store novel. Everybody brings their A-game. Heston’s casting seems bizarre but few actors have ever been as dignified or as solid. Screen legend Marlene Dietrich steals the show as an enigmatic fortune teller. Director of photography Russell Metty and Welles experiment with unusual camera angles and long elaborate takes including a celebrated opening shot which lasts for three and a half minutes without any cuts. Composer Henry Mancini (Breakfast at Tiffany’s) jazz score suggests bourbon fuelled late nights, sweat, and sin. Filming went well, but afterwards Welles was removed from the editing process. Touch of Evilplayed the B-movie circuit, usually as the second feature on a double-bill. Over the years the film’s reputation has grown and Touch of Evil is now recognised as being one of the last in the great cycle of Film Noir movies of the Forties and Fifties. These films were bleak, but exhilarating in the way the defied Hollywood conventions. They dealt with betrayal, and loss, and broken dreams and their cynical worldview struck a chord with post-War audiences. It is easy to make comparisons between Quinlan and Welles – both are brilliant men but the architects of their own downfall. Welles directed his first movie Citizen Kane (1941) at the tender age of 25. Media mogul William Randolph Hearst took offence believing correctly the film was a thinly veiled biopic of him and set his media pack loose on Welles. The Magnificent Ambersons(1942) was released in a truncated form after the studio RKO got fed up with waiting for Welles to return from filming a documentary in Rio and cut the film without him. Welles made other films on time and under budget, The Lady from Shanghai (1947) for instance, but the bad reputation stuck. After Touch of Evil Welles spent most of his time in Europe, occasionally appearing in big-budget Hollywood films like Casino Royale (1967) to raise funds for his own features.